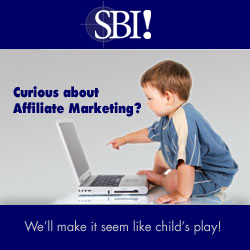 The Site Build It Affiliate Program is by far the largest way SiteSell markets its services – The 5 Pillar program is quite literally the foundations of SBI’s success with over 80,000 affiliates. For a company dependent on changing people’s lives, getting the message out there is somewhat vital! A powerful tool in today’s world of marketing is word of mouth. People trust other people they know and like. If a friend recommends a film, it’s going to have more power and meaning than if you see an ad in a newspaper or whatever. The point that SBI quite literally changes lives for so many people obviously has effect on friends, family, neighbours. 5P offers people the chance to harness this with it’s ‘Offline Sales Kit’. This includes basic ads and fliers – but also PowerPoint presentations, notes for seminars to host yourself and general ‘How-to’ advice about going offline. Aside from the standard creatives, there are dozens of marketing tips. For ANYONE looking to get into affiliate marketing, the Site Build It affiliate program really is a great way to get started. Aside from the tools, it essentially trains you how to become a successful affiliate.